In 2000 The Shryock family adopted their first German Shepherd Rescue dog. Subsequently Jennifer became involved with the rescue organization as a counselor and trainer finding herself supporting families with babies or young children who, overwhelmed by the challenges of their situation, were often on the verge of surrendering an otherwise beloved dog. Bethany Cunningham, CPDT-KA is a mom, professional dog trainer, and professional photographer. She holds a Bachelor’s Degree in Animal Science from Cal Poly, San Luis Obispo and is a Certified Professional Dog Trainer with a focus on behavior modification in pet dogs. Bethany has a deep love of animal behavior, child development, and visual arts, and is delighted by the fact that her multiple roles with Family Paws Parent Education bring all of those passions together. 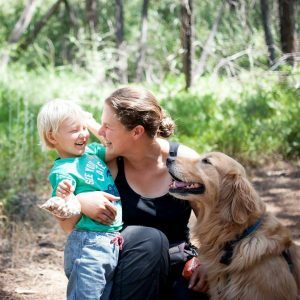 Bethany finds great joy in helping families succeed through relationship-building, empathetic practices for both dogs and children alike, and brings that enthusiasm to Family Paws both in her role with program development and as a co-instructor for the Family Paws Educator course. To learn more about Bethany, you can go to www.trainingbyconnection.com, or can view her portfolio at www.bethanyrosephoto.com.